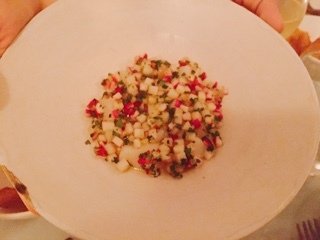 With all the buzz about Grey Gardens, Jen Agg's new co-owned restaurant, I knew I'd have to go. Having never been to Black Hoof, due to their no reservations policy (Grey Gardens, thankfully, accepts them), it’d be my chance to experience the creations of a restauranteur I’ve only heard about for so long. I admire her do-things-my-way attitude and outspokenness of the gender inequality issues within Toronto’s hospitality industry. Finally, I’d taste what people wait in line for. Browsing through their whimsical website, where the staff descriptions are so candid and funny, I thought for sure this would be the place for me. 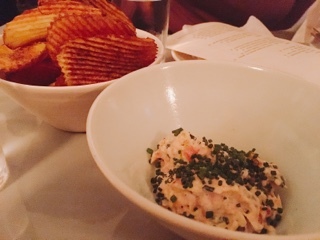 I like restaurants with good food, but skip the frou frou I’m-too-fancy-for-you attitude; Grey Garden’s laid back jokiness seems like they would welcome all walks of life. But then, after one dinner, I'm not so sure that they really care about their diners' comfort ... sure they’re not snobby, but it's definitely not a place that makes you want to sit and stay (I’ll expand at the end of the post). Thankfully, the kitchen makes good food. The chefs really know how to combine flavours and textures to create an interesting dish that’s not fussy. Indeed, I was glad to see co-owner Chef Mitchell Bates at the pass of the open kitchen, commanding in a quiet and serious manner. These dishes are coming out right. Although the chips in the smoked fish chips ‘n’ dip ($13) looked overdone, when combined with the rich fish, the stronger earthy potato flavor of the chip went so nicely with the creamy fish, it certainly didn’t get lost. To balance out the stronger flavours were bits of red onion and chives - each bite ends with a lovely zippiness. Dig into the sea of crunchy vegetable bits and you’ll find cubes of delicate raw scallop ($16) sitting in a silky crema on the bottom. 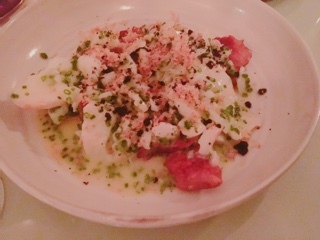 The dish is crunchy and smooth, slightly spicy but mellows out with the creama, and overall refreshing. 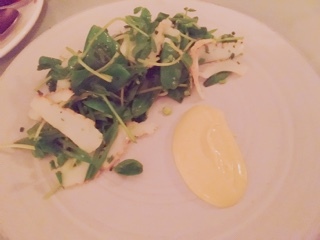 A similar contrast exists with the snow pea ($16) salad where slices of squid lay throughout combining the soft oceany meat with crisp raw peas. Eat it by itself and then add a bit of the citrusy aioli on the side, the creamy sauce completely changes the taste of the slightly peppery salad. 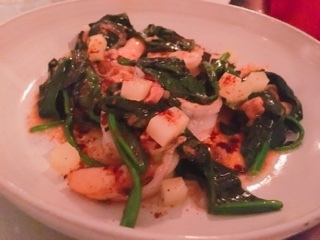 Grey Garden’s seafood focused menu continues to impress with the shrimp and spinach ($24), which is surprisingly strong compared to the simple menu description. The large sweet shrimp are tossed into a lovely buttery sauce that has a hint of garlic but not as overwhelming as scampi. Whereas the previous seafood starters were light and refreshing, this dish is rich and comforting. Even the sunchokes ($22) incorporate large flakes of salted cod giving the well roasted root vegetables interest. Given the sunchokes have a more full-bodied flavor, it’s also paired with a creamy sauce and pieces of black olive, which can hold up against the starch. The noodles in the alkaline ($24) were fresh and chewy, covered in a wonderful salty yuzu kosho sauce. 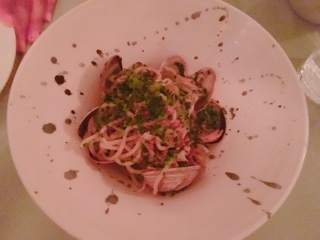 An abundance of clams and diced octopus helped to add a meatiness to the dish. For a pasta, it’s a rather small portion so you can easily have a bowl of the alkaline and smaller plates to make a full meal. It was delicious and I could have easily devoured a bowl to myself. 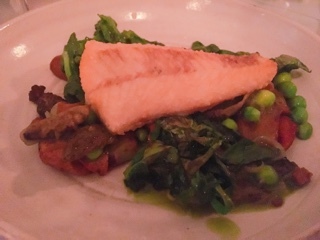 Compared to the other dishes, the pickerel ($28) was the most “normal”. The filet was simply seared and arrives with a lovely golden crust, while the sides are well balanced - English peas a bright spring addition compared to the earthiness of the morels and fingerling potatoes. If you couldn’t tell already, the food is wonderful, there wasn’t anything I didn’t enjoy that evening. Therefore, it pains me to say I can’t recommend Grey Gardens as its environment was just so uncomfortable. Despite making reservations two months in advance, our table of five was squished into a table of four – if we weren’t petite there’s no way we’d fit. To make matters worse, the tables are already so close together that it was even difficult to have our purses on the bench with us. Moreover, if everyone’s going to be packed like sardines, at least invest in adequate air conditioning - it was sweltering with the open kitchen. Who knows, maybe it’s Grey Garden’s way of giving diners a taste of the conditions their chefs endure. Believe me, I know your jobs aren't easy and respect and admire everything it takes to create such tasty dishes. I don’t need to sweat through my dress to appreciate your craft! The search description on their website notes, “You can never be all things to all people, but you can make a restaurant that meets all your needs, and maybe other people's too.” I’m not demanding person, but focusing on a restaurant’s need to generate revenue (by packing seats into small real estate) and lower operating costs (by skimping on air conditioning), doesn’t create something that will meet other people’s needs too. Who knows, maybe if I went under different conditions - in the winter, with only a table for two, and reserving a seating as soon as the restaurant opens (so the heat and crowds haven’t built up) - I may have glowing reviews about Grey Gardens. However, without ideal conditions, the food isn't good enough to warrant eating in such an uncomfortable environment. In this day and age, there are tons of great Toronto restaurants where I can get fantastic fare and not subject myself to being cramped and sweaty.